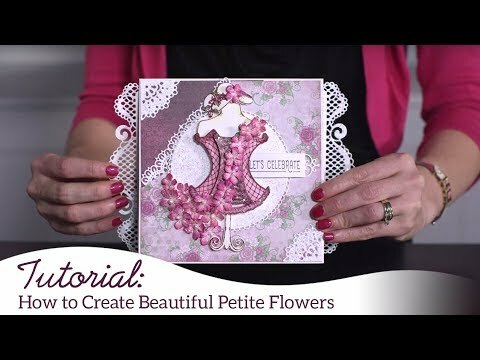 Instructions: Prepare a 5 x 7" white card base, topped with a piece of the Floral Fashionista 1/4 inch smaller. Locate the tag from the paper pack with the lamp on the table, cut out and adhere to the center of the card. Stamp the window on white cardstock with the Coffee ink, use the coordinating die and cut out, ink around lightly. Cut one of the Window Box Elements out, cut into and adhere to each side of the window. 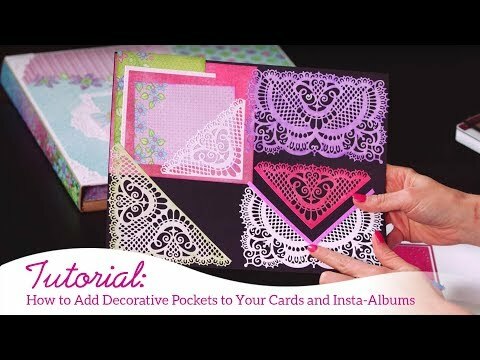 Place small foam dots on the back of window and adhere on top of the card tag in the center of the card. Stamp the leaves on white cardstock with the Library Green ink, color in with the Vivid Chartreuse, cut out with the coordinating die, shape using the Deluxe Flower Shaping Kit, adhere to both the top and bottom of the window as shown. Stamp the flowers on white cardstock with the Vibrant Fuchsia ink color in with the Rose Madder, cut out with the coordinating die, shape using the mold, put 2 of the flowers together and adhere to the top of the leaves. Stamp the sentiment on white cardstock with the Vibrant Fuchsia, use the Ornamental Tag to cut out and adhere to the bottom of the card. To finish, add glitter to both the leaves and flowers. Put the Nuvo White Crystal Drops in the center of each flower.